I'm proud to announce that My Kind Of Introduction has just launched the first edition of our very own online Parenting Newspaper!! 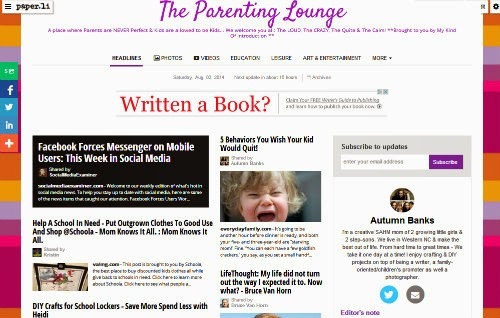 The Parenting Lounge is packed full of amazing articles from throughout the web - Many of the featured authors are who's articles decorate the pages of our paper are the brilliant bloggers that you see everyday! You'll also find articles from a few big names which include: Parents Magazine, ABC News among more. Our main interest is simply being a parent - other topics will pop up every now and then but of course we all know that children don't consume every moment of our lives so a bit of entertainment, a dash of World News and a splash of everything else - makes up the lovely sprinkles on top of our wonderfully delicious Hot Fudge Sunday!! Okay, okay -- I may have went a tad too far with the ice cream comparisons -- but you get what I'm trying to say don't you? Anyways... before I scare you away, head on over to The Parenting Lounge and join in on the conversation! !